According to the motto “Using the tried and true in creating something new”, BASF Wohnen + Bauen GmbH is building a new “Creation Center” office building for the employees of the BASF Design-Fabrik (“design factory”) on the roof of a former World War II air-raid shelter in Ludwigshafen. A roughly 20 meter high cube-shaped structure is being placed atop the roof of the former air-raid shelter, with an edge length of approx. 22 x 22 meters, in which a space of approx. 1,000 m² will be created on two levels. The section of the building is accessed via a stair tower and an elevator. 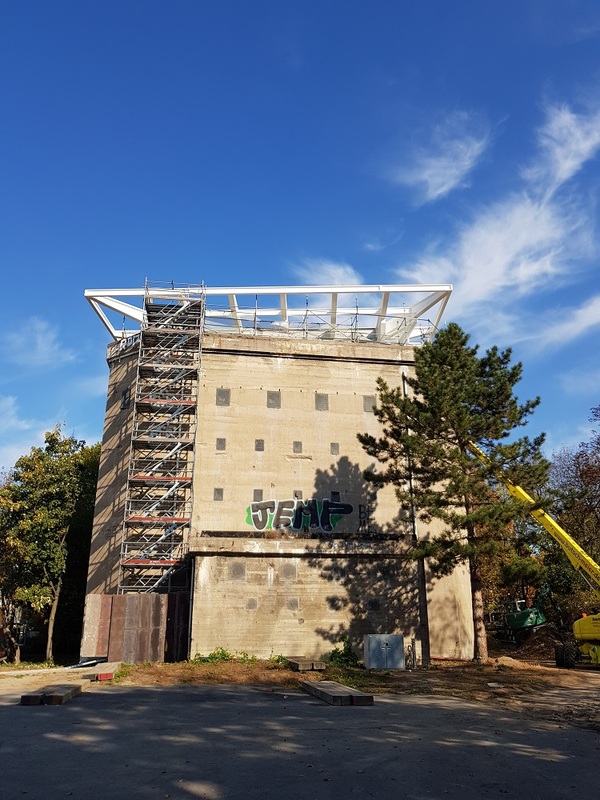 As part of the extension of the bunker, Donges SteelTec was commissioned by BASF Wohnen + Bauen GmbH to manufacture, deliver and install the steel supporting grid. 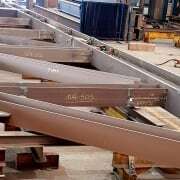 The scope of services included workshop planning, including drafting and detailed structural analysis, along with the application of an F90 fire protection coating. In advance, the existing reinforced concrete structure on the bunker ceiling was prepared for the new building section. 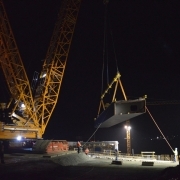 On a new reinforced concrete base to be erected, Donges SteelTec mounted a steel supporting grid capable of bearing the weight of the new two-story building. 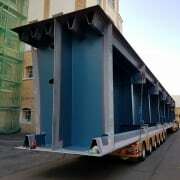 The total weight of the steel structure is approx. 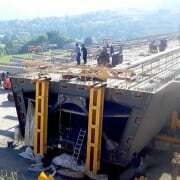 115 t, whereby heavy HEM 800 rolled girders and welded girders made of up the lion’s share of the tonnage. 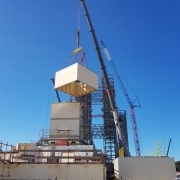 The steel structure was lifted onto the bunker roof mainly in individual sections and anchored there using threaded rods previously embedded in concrete. Afterwards, the fire protection coating was applied.